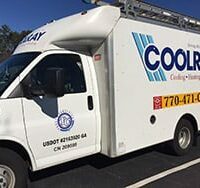 Celebrating 50 years in the business, Coolray now employs 355 men and women with 273 trucks to perform services to more than 300,000 customers in the Atlanta area. Coolray has been awarded the Angie’s List Super Service Award, Five-Star Rated Home Services Review and rated A+ by the Better Business Bureau. The employees of Coolray believe in offering fast, high-quality service to their customers. Coolray believes in treating the home and business with the respect it deserves— that’s how you earn respect yourself.